Getting into the property market can seem daunting, so Spence Club wanted to give our members an advantage by assembling an expert panel for our latest event. 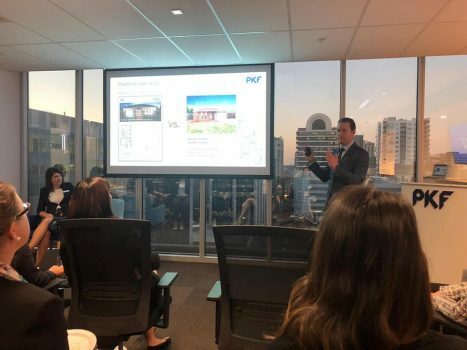 We partnered with PKF Adelaide to host the members-only Property Debate in the CBD, examining the pros and cons of investing in newly built versus established homes. Logic Finance managing director David Lipschitz delivered a compelling case for new build projects, arguing they would be ready for tenants from the get go, have lower maintenance costs and vacancy rates, enable access to the First Home Owner’s Grant (if you live in the property before renting it out) and offer stamp duty savings and better tax deductions. Academic Peter Koulizos then put the case for established houses, built before 1945, arguing that buyers or renters were willing to pay a premium for character homes in a market being overtaken by modern buildings. Older homes were also experiencing higher annual price growth than new properties, he told about 30 attendees on the night. Land appreciates while buildings depreciate. Apartments may not be the best option for investment properties due to resale o. New properties will be subject to more environmental requirements, such as solar or rain water tanks. Heritage listings can devalue character properties. High transaction costs like stamp duty mean it’s better to wait and save for your dream home, rather than settle for less and spend more to move later. If you’re looking for decent growth on your property investment be prepared to wait three to five years. We hope you learned something Spence Ladies! Thanks again to our hosts PKF Adelaide for providing expert commentary, welcome drinks and nibbles. Keep an eye on our website and social media (Facebook, Twitter, LinkedIn and Instagram) for details about upcoming events. If you’re not already in the Club, join us now to access discounted ticket prices. *The information provided is of a general nature only and does not take into account your individual financial situation. It should not be relied upon for specific professional advice.